A popular choice for trollers and live-bait anglers alike due to their incredible toughness. Lever drag allows precise control during the fight, allowing you to boat more fish. Graphite frame, anodized aluminum spool, stainless pinion, manganese-bronze main gear, 4 aircraft-grade sealed stainless ball bearings. "I'm on my second year with this reel, and I have to say, it's performed time after time with no issues. 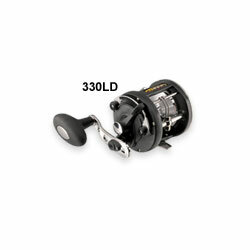 The lever drag is great on this reel, set and your done, you can store it between trips with the drag off and not worry about having to reset it." "i have 3 220's on Offshore OM2050's and love them. I use them for trolling and bottom fishing in 100' water, so spool size hasn't been an issue. they are perfect for what they are, and with regular(light) maintenace have never failed to perform."